For many people charged with a crime, entering the court system is almost as nerve-wracking as the potential sentence. When you are not accustomed to the often confusing courtroom procedures and jargon, it can all be extremely intimidating. Very often the most important thing we can do for our clients is to help them calm down, and explain that this isn’t the end of the world. You need someone on your side that knows what’s going on and how to help you. Our staff and attorneys are here to help. Whether you are facing misdemeanor possession charges or a more serious felony charge, having our experienced local defense attorneys on your side can provide major reassurance during this unsure time. From an arrest to a trial, your case will never be exactly identical to the circumstances of another person. However, because of laws and procedures, most cases follow the same basic steps. Many of our clients contact us because they received a criminal citation, or were told to expect one in the mail. This is actually a great time to contact an attorney since there is a lot we can do to get started right away. In many cases, we can avoid a criminal charge from happening by representing you at the hearing date. See Clerk Magistrate’s hearing, below. Most criminal charges start with an arrest by the police. You arrest will likely involve a search of your person and at some point, the reading of your Miranda Rights. Hearing those words directed at you for the first time feels vastly different than hearing them on television. Following your arrest, you will be taken to the jail where you will be processed, and given a court date for an Arraignment. A Clerk Magistrate’s hearing is where the state must show that they have sufficient evidence to charge you with a crime. If you weren’t arrested but were mailed or issued a criminal summons, you will have a show cause hearing. Attorney representation at a Clerk’s Hearing can be critical, as it is a chance to win your case before it even gets started. We can also plan your defense strategy at later court dates, if necessary, based on the evidence the police prosecutor presents. 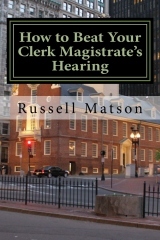 See our Clerk Magistrate’s hearing page for more details about how I very often win these hearings for my clients. An arraignment is usually the first court date in a criminal charge. There are 3 common ways that you could end up at a Massachusetts district court arraignment. If you were arrested, your first court appearance is the arraignment, usually the next business day. You can also receive a summons directly to an arraignment without being arrested. This can actually give us extra notice and time to work out a favorable arrangement to avoid a criminal charge. If you went to a clerk magistrate’s hearing and the clerk issued the complaint after saying there was sufficient probable cause shown to issue a criminal complaint is found, you will be given an arraignment. This is where you will be brought before the court and formally informed of the criminal charges against you. This is also where you will have your first opportunity to enter a plea. Typically, if you do not have an attorney present by this time, the court will enter a plea of “not guilty” on your behalf. Finding an attorney to walk you through all of the stages of the criminal court process is crucial and the sooner you do so, the better. Entering a plea is a serious matter and shouldn’t be taken lightly. Contact me today for some free legal advice on your case and how you should best proceed. While it can be helpful to have your attorney present at the arraignment, it isn’t absolutely necessary. But you should be planning to hire an attorney soon. Without an attorney, very little happens at an arraignment. You will mostly just be getting another court date to a pretrial conference. At the arraignment, the judge will likely also visit the issue of bail. Bail is usually not an issue for most low-level criminal charges in Massachusetts. When arrested for a misdemeanor offense, after being booked and processed you usually have to pay a minimum of $40 for the bail commissioner fee, which is the equivalent of being released on your “own recognizance“. For more serious charges, where you are held in jail for arraignment, there will be a bail hearing. If it is believed you might flee instead of face charges, or you have a previous record of failure to appear for court dates, the judge will set a bail amount to compel you to face the court in the future. At a bail hearing, we would bring up any relevant facts such as your ties to the community, and your employment, resident status to keep the bail amount as minimal as possible. The pretrial conference is a meeting between you, your attorney, and the prosecution. Here court documentation will be processed and several aspects of your case can be discussed. This is also the most likely point in your case for a plea agreement to happen. The majority of criminal cases end in a plea bargain and never make it to trial. A plea bargain is when the prosecution agrees to lower the charges against you or recommend a more lenient sentence in exchange for a guilty plea or a CWOF (Continuance Without Finding). The decision to move forward with any plea bargain should only be done after consulting with your attorney. A CWOF is similar to a “no contest” plea and is not the same as admitting guilt. If the prosecution agrees to a CWOF you are essentially admitting that there is evidence suggesting you committed the crime in question, and that evidence is sufficient to find you responsible. A CWOF can look better than a guilty plea on your criminal record and that is largely why it is used. You can legitimately claim that you have not been convicted of a crime if you took a cwof. However, if you find yourself in trouble again, a CWOF will absolutely be considered a prior offense. Before your case goes to trial, if it makes it that far, there are many potential additional hearings that it can go through. The majority of these are known as “motion hearings” and involve evidence admissibility, among other things. The longest part of the trial is the presentation of evidence as each side can continue to take turns, laying out their case and challenging what the other side has said. Here is your defense attorney’s time to point out errors in the prosecution’s case as the prosecutor attempts to prove you are guilty beyond a reasonable doubt. If you are found guilty at trial, the judge may take up sentencing immediately if it is a misdemeanor offense. With felony charges, it is more common to postpone sentencing for a later court date. There are many things taken into consideration during the sentencing process. Take a look on my page of criminal offenses for more information.